When people here the name “Clooney”, they automatically think of George Clooney, one of Hollywood’s biggest stars. But it was his aunt, Rosemary, who first catapulted the name into the bright lights, with a dazzling singing career that stretched from the late 1940s through to her death in 2002. Drawing on interviews with family members, managers, promoters and the jazz musicians who worked with her, as well as contemporary newspaper articles and reviews, Late Life Jazz tells the story of one of America’s finest singers. The book traces Rosemary’s life from her hardscrabble beginnings in Marysville, Kentucky, through to her rise to pop stardom in the early 1950s when she topped the Hit Parade with songs such as “Come On-a My House”, “This Ole House” and “Half As Much”. And all of this whilst enjoying a show business marriage to actor, Jose Ferrer, and producing five children. By the 1960s, her marriage was on the rocks, the music scene was changing and her personal turmoil, fuelled by an addiction to prescription medication, almost destroyed her career - and her life. She underwent several years of therapy and recuperation before she was able to perform again. Few expected her to be anything but a nostalgia baroness but Rosemary had other ideas. Rejuvenated by a series of concerts with her friend and mentor, Bing Crosby, she found a new medium in the midst of America’s finest jazz musicians, building a second career and with it a reputation as one of the finest interpreters of the Great American Songbook. 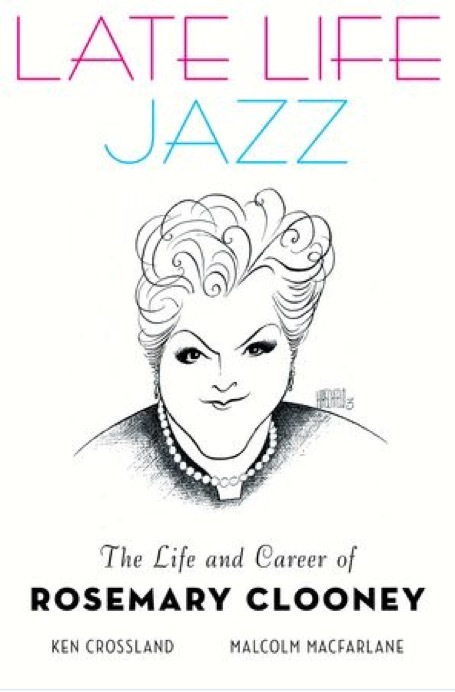 Vividly written and painstakingly researched, Late Life Jazz explores the rise, fall and rise again of Clooney the First, aunt Rose, jazz singer par excellence.